It has been known for many decades that the brain undergoes critical periods of development during the early years. However, only recently has it been discovered that brain development does not stop after early childhood. Indeed, new evidence shows that certain regions of the human brain continue to develop during adolescence and beyond. Some of these regions, in particular the prefrontal cortex (PFC) and superior temporal cortex, are involved in social cognitive processes, such as understanding others’ minds. Thus, it might be expected that certain social cognitive processes undergo refinement during adolescence. While there is a mass of self-report data on social development during puberty and adolescence, until recently very little empirical research had investigated social cognitive development after childhood. Here, I describe studies that fill that gap. An adult brain has about 100 billion neurons; at birth, slightly fewer. However, during development many changes take place in the brain. Neurons grow, which accounts for some of the change, but it is the wiring of connections between cells (synapses) that undergoes the most significant transformation. Early in development, the brain begins to form new synapses, so that the synaptic density (the number of synapses per unit volume of brain tissue) in young animals greatly exceeds adult levels. This process of synaptic proliferation, called synaptogenesis, lasts up to several months, depending on the species of animal. It is followed by a period of synaptic elimination (or pruning) in which frequently used connections are strengthened, and infrequently used connections are eliminated. This experience-dependent process, which occurs over a period of years, reduces the overall synaptic density to adult levels. Research on rhesus monkeys demonstrated that synaptic densities reach maximal levels two to four months after birth, after which time pruning begins. Synaptic densities gradually decline to adult levels at around three years of age, around the time monkeys reach sexual maturity (Rakic, 1995). Educational literature often suggests that the crucial phase of brain development in humans occurs from birth to three years and that during this time children should be exposed to all sorts of learning experiences. However, this claim makes the assumption that the time course of synaptogenesis is the same for humans as it is for rhesus monkeys. In the next section I describe the first experiments that looked at development of the human brain. Cellular studies The time course of synaptogenesis and synaptic pruning is different for different brain areas, and different classes of neurons in the same brain region gain and lose synapses at different rates. Moreover, brain development varies between species. The only available data on the development of the human brain suggest that synaptogenesis follows a different time course from that in animals. In the human visual cortex, there is a rapid increase in the number of synaptic connections at around two or three months of age, which reaches a peak at eight to 10 months. After that there is a steady decline in synaptic density until it stabilises at around age 10 years and remains at this level throughout adult life (Huttenlocher, 1979). 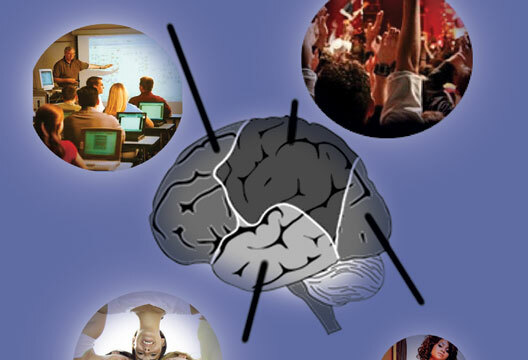 Different areas of the human brain develop at different rates. In the human frontal cortex – the brain area responsible for planning, integrating information and decision making – synaptogenesis occurs later and the pruning process takes longer than in the visual cortex. In this area, neuronal development continues throughout adolescence: synaptic densities peak at around age 11 and then decline during adolescence and into the twenties (Huttenlocher, 1979). MRI studies The scarcity of post-mortem brains meant that knowledge of the adolescent brain was until recently extremely scanty. However, since the advent of magnetic resonance imaging (MRI), a number of brain-imaging studies, using large samples of participants, have provided further evidence of the ongoing cortical maturation into adolescence and even into adulthood. One of the most consistent findings from these MRI studies is that there is a linear increase in white matter, and a net decrease in grey matter, in certain brain regions during childhood and adolescence. These changes are most significant in frontal and parietal regions (Giedd et al., 1999; Sowell et al., 1999). The rise in white matter with age reflects an increase in the myelin sheathing surrounding axons in the frontal cortex. While the increase in white matter is linear, the changes in grey matter density appear not to be. In one of the first MRI studies of human brain development, Giedd et al. (1999) performed an MRI study on 145 healthy boys and girls ranging in age from about four to 22 years. The volume of grey matter in the frontal lobes increased during childhood with a peak occurring at around 12 years for males and 11 years for females. This was followed by a decline during adolescence. A similar non-linear pattern was found for other cortical regions including parietal and temporal lobes. These findings have been replicated by a number of MRI studies (e.g. Gogtay et al., 2004). Generally, it has been found that brain areas associated with more basic motor and sensory functions mature first, followed by brain regions related to higher cognitive function. The non-linear pattern of grey matter development during adolescence has been interpreted as reflecting, at least in part, the synaptic reorganisation that occurs at the onset of and after puberty (Huttenlocher, 1979). Thus, the peak in grey matter at the onset of puberty (Giedd et al., 1999) is thought to reflect a wave of synapse proliferation, which is followed by synaptic pruning during adolescence. Given that certain brain areas are subject to protracted development, it might be predicted that cognitive abilities that depend on the functioning of these brain areas would also develop. In the next section, I consider the implications of structural brain development during adolescence for cognition. Cognitive abilities that rely on the brain regions that undergo the most protracted development – including PFC and superior temporal sulcus (STS) – include executive function and social cognition. There is evidence that a variety of executive function abilities undergo refinement during adolescence (e.g. Anderson et al., 2001; see Blakemore & Choudhury, 2006, for a review). Here, I focus on the development of social cognition during adolescence. Theory of mind, or mentalising, refers to the inferences that we naturally make about other people’s intentions, beliefs and desires, which we then use to predict their behaviour. A number of neuroimaging studies, using a wide range of tasks, have reported activation in a highly circumscribed ‘mentalising network’, comprising the medial PFC, the STS and temporo-parietal junction (TPJ), and the temporal poles (see Frith & Frith, 2006, for a review). Lesion studies have also implicated the frontal cortex and STS/TPJ in mentalising (see Apperly et al., 2005, for a review). It has been known for many decades that the ability to attribute mental states develops over the first few years of life, culminating in the ability to pass complex false belief tasks by about age four or five (Barresi & Moore, 1996). While typically developing children are able to pass theory of mind tasks by five, the brain structures that underlie mentalising undergo substantial development beyond early childhood. Yet the development of social cognitive abilities such as mentalising after early childhood has been neglected. I now turn to two recent studies that have investigated development of social cognition during adolescence. The first concerns perspective-taking ability, a skill that is crucial for successful social communication. In order to reason about others, and understand what they think, feel or believe, it is necessary to step into their ‘mental shoes’ and take their perspective. Perspective taking includes awareness of one’s own mental states (‘first-person perspective’) and requires the ability to ascribe viewpoints, mental states or emotions to another person (‘third-person perspective’). Functional neuroimaging studies have revealed that medial PFC, inferior parietal lobe (IPL) and STS are associated with making the distinction between third and first person (e.g. Ruby & Decety, 2001, 2004). We recently investigated development of perspective taking during adolescence (Choudhury et al., 2006). We tested pre-adolescent children (mean age 9 years), adolescents (mean age 13 years) and adults (mean age 24 years,) on a perspective-taking task that required participants to imagine either how they would feel (first person) or how a protagonist (third person) would feel in various scenarios. Participants were asked to choose one of two possible emotional faces in answer to each question, as quickly as possible. Each participant’s reaction time difference between first and third person perspective was calculated. The results showed that this reaction time difference decreased significantly with age. This finding suggests that the efficiency of perspective taking develops during adolescence, perhaps in parallel with the underlying neural circuitry. Whether this response pattern is because younger participants found it difficult to differentiate between the first and third person, or younger children are less inclined, or find it more difficult, to enter into another person’s ‘mental shoes’, requires further investigation. The differences between age groups may also be influenced by differences in social experience. Perhaps adults show no significant difference between the time it took them to answer first and third person perspective questions as a result of their mature neural circuitry supporting social cognition, as well as their greater social experience. Next we turned our attention to the development of intention understanding. In a recent fMRI study, we investigated how the functioning of the mentalising brain network changes with age (Blakemore et al., in press). The aim of the study was to explore adolescent development of the brain regions involved in thinking about intentions. A group of adolescents (mean age 15) and a group of adults (mean age 28) responded to scenarios related either to their own intentions and consequential actions (intentional causality) or to physical events and their consequences (physical causality). We investigated how activity during these tasks in the adult brain compares with activity in the adolescent brain. The results showed that both groups recruit the mentalising network (medial PFC, STS/TPJ and temporal poles) during intentional causality relative to physical causality. However, adolescents activated the medial PFC part of this network to a significantly greater extent than did adults. Activity in a particular part of medial PFC during intentional causality occurred only in the adolescent group. This suggests that adolescents use additional regions of the medial PFC to achieve the same performance as the adults. The results imply that the demand on medial PFC circuitry during mentalising tasks is higher in adolescence than in adulthood. One possible explanation is that cortical development, in particular grey matter reorganisation in the PFC (e.g. Giedd et al., 1999; Gogtay et al., 2004), mediates this developmental change in medial PFC recruitment. As described above, it has been suggested that the loss of grey matter in PFC during adolescence reflects synaptic pruning. It is unknown whether the synaptic pruning that occurs during human adolescence in parts of the brain (including the PFC) fine-tunes neural tissue into specialised networks in the same way as during early development. If this is the case, then such regions may not function as efficiently in adolescents as in adults. As a result, it is possible that they contain less efficient connections, which may result in more widespread, diffuse activity for tasks that involve processing in these areas. The results of our study suggest that adolescents require more activity in medial PFC when using mental-state representations during the intentional causality task. Part of the right STS, which, like medial PFC, is part of the mentalising network, was activated by intentional causality for adults only. This suggests that activity within the mentalising network shifts from anterior (PFC) regions to posterior (STS) regions with age over the period of adolescence. While children start to pass explicit theory of mind tasks by five years, the data described in this review suggest that the neural basis of theory of mind continues to develop well past early childhood. Social cognitive development during adolescence is a new and rapidly expanding field and yet many questions remain unanswered. The relative roles of hormones, culture and the social environment on the development of the social brain are unknown. Future research is needed to disentangle the contributions of biological and environmental factors to the developing social brain. - Dr Sarah-Jayne Blakemore is at the Institute of Cognitive Neuroscience, University College London. E-mail: [email protected]. How does brain development during adolescence interact with hormonal and social environmental changes occurring during this period of life? Is synaptic pruning during adolescence susceptible to environmental influence as it is during early development? Recent studies have shown that cannabis consumption during adolescence increases the risk of developing psychosis (e.g. Arseneault et al., 2002). How exactly does cannabis affect adolescent brain development? Apperly, I.A., Samson, D. & Humphreys, G.W. (2005). Domain-specificity and theory of mind. Trends in Cognitive Science, 9(12), 572–577. Anderson, V., Anderson, P., Northam, E., Jacobs, R. & Catroppa, C. (2001). Development of executive functions through late childhood and adolescence in an Australian sample. Developmental Neuropsychology, 20, 385–406. Arseneault, L., Cannon, M., Poulton, R. et al. (2002). Cannabis use in adolescence and risk for adult psychosis: longitudinal prospective study. British Medical Journal, 325, 1212–1213. Barresi, J. & Moore, C. (1996). Intentional relations and social understanding. Behavioral and Brain Sciences 19, 107–154. Blakemore, S-J. & Choudhury, S. (2006). Development of the adolescent brain: Implications for executive function and social cognition. Journal of Child Psychology and Psychiatry, 47(3–4), 296–312. Blakemore, S-J., Ouden, H.E.M. den, Choudhury, S. & Frith, C. (in press). Adolescent development of the neural circuitry for thinking about intentions. Social Cognitive and Affective Neuroscience. Choudhury, S., Blakemore, S-J. & Charman, T. (2006). Social cognitive development during adolescence. Social Cognitive and Affective Neuroscience, 1(3), 163–164. Frith, C.D. & Frith, U. (2006). The neural basis of mentalizing. Neuron, 50(4), 531–534. Giedd, J.N., Blumenthal, J., Jeffries, N.O. et al. (1999). Brain development during childhood and adolescence: A longitudinal MRI study. Nature Neuroscience, 2, 861–863. Gogtay, N., Giedd, J.N., Lusk, L. et al. (2004). Dynamic mapping of human cortical development during childhood through early adulthood. Proceedings of the National Academy of Science, USA 101, 8174–8179. Huttenlocher, P.R. (1979). Synaptic density in human frontal cortex: Developmental changes and effect of aging. Brain Research, 163, 195–205. Rakic, P. (1995). Corticogenesis in human and nonhuman primates. In M.S. Gazzaniga (Ed.) The Cognitive Neurosciences (pp.127–145). Cambridge MA: MIT Press. Ruby, P. & Decety, J. (2001). Effect of subjective perspective taking during simulation of action: A PET investigation of agency. Nature Neuroscience, 4, 546–550. Ruby, P. & Decety, J. (2004). How would you feel versus how do you think she would feel? A neuroimaging study of perspective-taking with social emotions. Journal of Cognitive Neuroscience, 16, 988–999. Sowell, E.R., Thompson, P.M., Holmes, C.J. et al. (1999). Localizing age-related changes in brain structure between childhood and adolescence using statistical parametric mapping. Neuroimage, 9, 587–597.